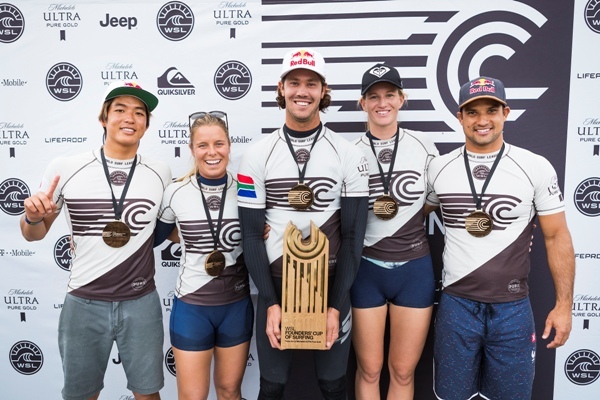 LOS ANGELES, California/USA (Monday, February 26, 2018) – The World Surf League (WSL) today announced the Founders’ Cup of Surfing presented by Michelob ULTRA Pure Gold, a historic region-versus-region teams event featuring a cross-section of the world’s best surfers to be held at Surf Ranch in Lemoore, CA from May 5 – 6, 2018. Five teams – USA, Brazil, Australia, Europe and World – made up of men’s and women’s surfers from the elite WSL Championship Tour, will compete over the two-day event at the world-class, man-made wave venue of Surf Ranch in Lemoore, California. The competition will be hosted against a festival backdrop honoring the culture of surfing – food, music, beverage, art and special guests will all be on site for enjoyment. The Surf Ranch facility, which was revealed online to the public in December 2015, boasts the best man-made wave in history – a 700-yard, high-performance, bi-directional wave featuring barrel sections and maneuver sections. Primarily existing as a testing facility, the Lemoore site has spent the past two years dialing in the technology under the guidance of 11-time WSL Champion Kelly Slater (USA) and feedback from visiting WSL surfers. A private test event last September proved very successful, paving the way for the May Founders’ Cup of Surfing to be the first time the public will be allowed onto the grounds. Presenting sponsor, Michelob ULTRA Pure Gold, is made with sustainably sourced organic grains and features ingredients free from artificial colors and flavoring. Michelob ULTRA Pure Gold was born from a commitment to innovate using ingredients and inspiration from nature. SANTA MONICA, CA/USA (Tuesday, May 24, 2016) – WSL Holdings, the parent company of the World Surf League (WSL), today announced an agreement in principle to acquire a majority stake in the Kelly Slater Wave Company (KSWC).The partnership between the WSL and KSWC will be dedicated to promoting the growth of high-performance surfing around the world. KSWC’s revolutionary technology creates a number of possibilities for the future of the sport. The WSL and the KSWC envision the build-out of a global network of WSL-branded high-performance training centers utilizing this wave technology.